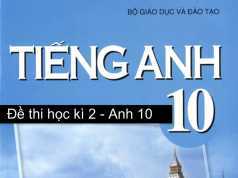 Các em cùng tham khảo đề thi học kì 1 lớp 10 môn Tiếng Anh 2016. 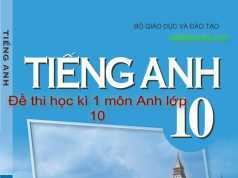 Đề thi có hình thức trắc nghiệm với thời gian làm bài là 45 phút. 1. Identify the word whose underlined part is pronounced differently from the others. 2. Identify the word whose stress pattern is placed differently from the others. 1. 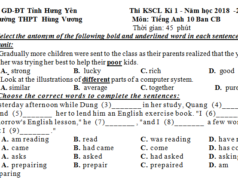 Choose the most suitable option (A, B, C or D) to complete the following sentences. 1. Mary was late yesterday, ________- was unusual for her. 2. His mother ________- she would back in an hour. 3. The teacher doesn’t allow ________- dictionaries in the final exam. 4. Radios, providing information aurally, are useless to ________- person. 5. Internet is a very fast ________- convenient way for us to get information. 6. Television ________- only for the last forty or fifty years. 7. Thousands of animals are said ________- in the forest fire recently. 8. It is so sad that some secondary students are still ________- to read and write. 2. Put the verbs in brackets into the correct tense – forms. 1. When we felt thirsty, we stopped (drink) ____________. 2. The girl (sit) ___________- next to me is very clever. 3. That accident (happen) ___________- a year ago. 4. I am afraid that all the documents (destroy) ___________- in a fire yesterday. 5. Although living abroad for 2 years, I still can’t get accustomed to (be) ___________- alone. 6. Do you think the teaching work in the special class (be) ___________- time-consuming. 7. In 1894 Marie (meet) __________- Pierre Curie in the School of Physics and they (marry) __________- a year later. 3. Give the correct form of the words given. 1. Every (employ) ___________- in this company has received a pay rise. 2. I really like my friend Lien. She’s always so kind and (cheer) ____________. 3. We have already visited a (picture) ___________- fishing village near Ha Long Bay. 4. You should always listen (attention) ___________- to your teacher in class. 4. Find out the mistakes in the following sentences and then correct them. Read the text carefully and do the tasks that follow. Of the two broad categories of newspaper, the popular and the quality, the former have a readership of millions while the latter, only hundreds of thousands. Yet the popular newspapers seem largely designed for entertainment, with quizzes, competitions, cartoons and light-hearted stories. The quality newspaper put a much higher value on information and a much lower one on entertainment. It is not only in content that the two types of newspaper differ. Also, there us a difference in the style in which the articles are written. The popular newspapers generally use more dramatic language with a lot of word-play. Their journalists tend to use shorter sentences and to avoid fewer well-known vocabulary. This means that popular newspaper are easier for native speaker to understand though they are probably not for non-native speaker. In order to decide whether a newspaper is a quality or a popular one, it is not even necessary to read it, since you can simply tell by the way it looks. Popular newspaper are generally smaller with shorter articles and fewer columns per page. They have bigger headlines and more photographs. However, quality newspaper have greater number of articles per page than popular newspapers. 1. ___- The text implies that most newspaper readers read newspapers mainly for information. 2. __- Popular newspapers put great emphasis on entertainment. 3. ___- Quality newspapers have longer articles and more columns per page. 4. ___- Popular newspapers are easy for foreigners to read. The biggest difference between the popular and the quality newspapers is the information (1) __________. The (2) _________- newspaper often put a higher value on entertainment and lower one on information. Besides, these two categories of newspaper have different writing (3) __________. They also differ in the length and (4) _________- of the articles per page. 1. Thank you very much / invitation / spend three weeks / August / you / your family / Scotland//. 2. I / love / come / unfortunately / I / be / unable / accept //. 3. My cousins, / who live / Canada, / stay / us / August 3rd / August 18th //. 4. As it be / first / visit / this country, I plan / show them round //. 5. It / be / possible / visit you / September instead //? 6. I certainly need / rest after / cousins go back / Canada //. 7. Please tell me / if / September / be / convenient //. 8. I / look forward / see / you all again. 1. The trip was so interesting that we couldn’t forget it. à It is_________________. 2. We haven’t been to London since 1998. à The last_________________. 3. Because of the heavy rain, they couldn’t go for a picnic. à Because_________________. 4. I have never seen such a bad film as that one. à That’s__________________.